In 1838 Samuel F. B. Morse demonstrated a model of his telegraph before the Franklin Institute, and in 1844, upon receiving an appropriation from congress, he built a line between Baltimore and Washington. It consisted of a key (switch) and electromagnetic (sounder) at each end in series with a wire and a battery; the earth acted as the return line. Either key sent a series of impulses, in the form of a pre arranged code representing the various letters of the alphabet, to energize the sounder at the other end of the wire. a number of telegraph companies were founded thereafter, some licensed under Morse’s patents and others employing a printing type of telegraph. these were all ultimately merged into the Western Union company. In the meantime, cables were laid across the Atlantic by Cyrus W. Field and others, the first permanent one being laid in 1866. Since that time there have been evolved two-way (duplex) and four-way (quadruplex) transmission on a single line, multiplex, varioplex, carrier telegraphy, Desk-fax, and microwave radio relay links. Indeed, telegraphy has advanced more rapidly in recent years than when first developed. Telegraph codes. In the Morse code used on manually operated lines in the United States, and the International or Continental code, used by foreign countries and in radio telegraphy, a short pulse is known as a dot, and a pulse three times as long is known as a dash. These, with the intervening spaces, forms the codes illustrated. C .. . C _._. D _ .. D _ ..
F . _ . F .._.
G _ _ . G _ _ .
L __ L . _..
N _ . N _ .
P ….. P . _ _ .
R . .. R . _ . Z … . Z _ _ ..
5 _ _ _ 5 …..
6 …… 6 _ …. 8 _ …. 8 _ _ _ ..
9 _ .. _ 9 _ _ _ _ .
Interrogation_.._. Interrogation .._ _ ..
Colon _ . _ . . Colon _ _ _ . . .
Semi-colon ... .. Semi colon _._._. Question Mark .._. . Question Mark … _. When I was just a young boy, weekly evening radio programs provided an escape from the isolation of farm life in winter. Or any time for that matter. On this particular occasion, I was hunkered down close to the large cabinet radio in our sitting room so as not to miss a word. We were listening to an episode of “The Lone Ranger.”It was always exciting, filled with suspense. And there seemed always to be lot of bad hombres around. One particular episode centered around the young son of a “well to do” rancher. He had suffered the misfortune of being thrown from his horse, resulting in serious injury to his spine. It left him bedridden and unable to walk. Then it just so happened at that time, the Lone Ranger and his riding companion Tonto came to call at the ranch. Years before, they were instrumental in helping the rancher settle a range dispute with land speculators. Traveling in the area, they decided to drop in and renew acquaintances with the rancher. After an initial greeting of welcome, they found the rancher to be quite despondent. He shared details of the accident incurred by his son. His young boy was recovering, but still lying in bed with a very uncertain future. He would have to reconcile himself to the fact that he never would ride the range again, galloping headlong with the ranch crew on the range as they trailed a herd. The boy in his bedroom felt some excitement when he heard his father exclaim at the surprise arrival of his old friends. The boy had heard of the masked man. His coming to the aid of those in need on the frontier. His heroism in the face of danger. There was hushed conversation for a moment out front, then the distinct sound of high heeled riding boots approaching the boys bedroom door. The boy was in awe as his father quietly brought the Lone Ranger into his room and introduced him. The boy felt an aura of strength and courage that emanated from the masked man who reached out and firmly took his hand. Realizing the challenges the young boy would face, the masked man sat down on the bed and in conversation emphasized the importance of continuing his schooling. Opportunities would surely come. The boy was encouraged by the deep confident voice of the masked man. He promised to continue his schooling and would one day surely make his mark on this fast developing western frontier. Around the fire in camp that evening the Lone Ranger and Tonto mused about the fate of the young boy. They wondered what might be in store for him. Then after a short silence, over the crackle of the dying fire, Tonto exclaimed! “uuhhh, Him mebbe could learn talk on wire!” Yes !! “excellent idea Keemosabe!” exclaimed the Lone Ranger. told how he could become an important part of the fast growing Railroad and Telegraph Industry. The rancher was all smiles at the prospect of his son now having an opportunity to make his way in life. As soon as breakfast was done, he ordered up the buckboard to be brought up for a trip to town and a visit with the Station Agent. There he was received warmly.The Company was growing rapidly, opening new depots by the week and they were scrambling to find telegraph operators to fill them. 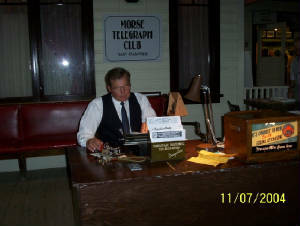 The agent would gladly take the lad on and teach him to be a telegrapher. The boy was keen and rapidly became acquainted with the key, the code and from his perch in a quiet corner of the office, he practiced copying Morse traffic chattering on the line. Over time the agent was pleased with the progress of his young apprentice. His apparent aptitude was reported to the division office. They would have a position for him when he was ready! As all good stories go, there was an incident when the agent would become incapacitated. Bad hombres up the track would attempt to hold up and rob the train, the lad would get off an emergency telegram to the sheriff, the holdup would be thwarted and the young lad would become the hero of the day! The Lone Ranger and Tonto would definatley be pleased.